Alligator Pools of Naples Inc., provides full-service pool repair by an established company. Relax and enjoy outdoor living a clean and safe pool. Avoid the high cost of pool replacement with affordable repair services. Alligator Pools of Naples offers a wide range of pool service and repairs for commercial and residential pools including heaters, lights, filter systems, and pumps. When your pump needs replacement, we install new variable speed energy efficient pumps. We repair it all, not a job to big or too small. We are a warranty service station and offer manufacturer's warranties on all components used for repairs. 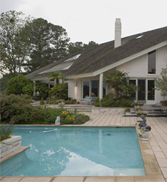 Our team is fully licensed, insured, and trained in all facets of pool and liner repair. Alligator Pools of Naples repairs large commercial fountains. We also provide service for both residential and commercial fountains.